Set atop the cliffs by Bulgaria’s stunning eastern coast, the Lighthouse Resort looks out over the beautiful Black Sea, an idyllic location for any golf holiday. Sharing the same stretch of coastline as the world-renowned Thracian Cliffs, Lighthouse Golf Course has played its own part in the emergence of Bulgaria as a popular European golf destination. Designed by the legendary Ian Woosnam, Lighthouse Resort was selected to join the prestigious European Tour Properties network and will host European Tour Senior Classic in 2018. Located less than an hour drive from Varna International Airport, the Lighthouse Resort is within easy reach of the seafront and the local town, Balchik. You have the choice of two great accommodation options on the resort; the 3-star villas and apartments, great for groups and superb value for money, or the main hotel, a 5-star luxury establishment boasting unparalleled comfort for holidaymakers. With the golf course just metres from the residences, you have everything you need on-site, including multiple dining options and two swimming pools. The lush, parkland-style course by Ian Woosnam at Lighthouse Resort makes the most of its position on the dramatic limestone cliffs overlooking the Black Sea. The panoramas here are truly distracting but that's one thing you can't afford to indulge yourself in too much if you want to carve out a decent score on this striking course. Woosnam laid out this course as all resort layouts should be, with golfers of many different abilities in mind. There are multiple teeing areas on every hole and the design is challenging enough to entertain but never punitive in the way some egotistical designers like to make their signature courses. At 6,720-yards and with a par of 71, the Lighthouse course blends challenge and playability to perfection, especially considering the fickle nature of the breeze off the Black Sea. The greens are superb; large, undulating but always true. Perhaps most surprising of all is the mature feel to the whole site. It was completed in late 2008 but you'd never guess with its strands of mature trees and the high quality of the fairways and greens. The climate in this region of Bulgaria, called Cape Kaliakra, is surprisingly good - Mediterranean-like in fact. 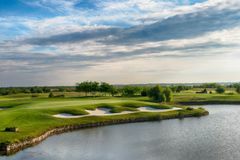 That's largely down to the proximity of the Black Sea, and on its shores, near the village of Balchik, 30 miles north of Varna, you'll find a cluster of world-class golf developments. One of the very best is Lighthouse Resort. Now open is the onsite 5-star hotel at Lighthouse, with 174 opulent rooms and suites from which to choose. The 30 spacious apartments and dozens of villas situated around the golf course are serviced just like a hotel and offer terrific value for money. All are handsomely designed with every modern comfort, including air conditioning, flat-screen televisions, cable TV and high speed Internet access. The apartments are a short stroll from the Lighthouse golf course, Spa, fitness centre and swimming pools. The luxury villas are located across the resort and are fully furnished with two or three bedrooms, and some even have their own pools. The focal point of the resort is the state-of-the-art clubhouse with an extensive range of amenities including professional tuition, pro shop, restaurant serving superb international cuisine, a large and well-stocked bar and secure locker rooms. Off the golf course, you can spend your time on the tennis court, fishing, boat trips or paragliding - but such is its quality you'll probably be reluctant to do anything but swing your sticks! Far to many bunkers.we all enjoyed the course.pro shop staff very helpful and pleasant.buggies a little expensive.